WEST BRANCH, Mich. – Students from three Michigan colleges and one college in New York are embarking on a 12-week, hands-on summer internship program at Griffin Beverage Co.’s flagship warehouse in West Branch, Michigan. The four students were chosen out of more than 50 applicants from across the country. Achieng and Velayudham are international students, with Achieng hailing from Kenya and Velayudham from India. Griffin Beverage Co., a family owned beer distributor, services 43 counties throughout Michigan with warehouses in Alpena, Marquette, Saginaw, St. Ignace and West Branch. As one of the world’s largest wine producers, France has maintained an enviable spot as a worldwide winery for centuries. For Eric Kendig, president of Arbor Beverage Company, the opportunity to tour the myriad of French wineries posed not a challenge, but an opportunity to expose wine lovers in Michigan to unique and affordable wines to add to their collections. From Saline, Michigan, Eric has served as president of Arbor Beverage for nine years. The distributor, however, has been providing high-quality wines to six counties in southeast Michigan for over 58 years. La Craie Vouvray – Grown on tuffeau clay soils near the village of Vouvray and exposed to early morning fogs, this white wine is a lovely mix of candied apricots, spice and wildflower honey with a firm acid backbone. Les Hexagonales Sauvignon Blanc – “Les Hexagonales” Sauvignon Blanc weighs in at only $14 and rivals Sancerre in its crisp acidity, slate minerality and full-frontal fruit. Your mouth wallows in green apple, stone fruit and citrus, finishing with tangerine dreaminess and a swath of tangy lime that lasts forever. There is an astounding, jaw-dropping value in this wine. Domaine de la Bastide Cotes du Rhone Figues – A dry and fruity red wine made up of 60 percent Shiraz, 20 percent Grenache and 20 percent Carignan. It’s deep red purple in color. On the nose, there is an abundance of ripe dark fruits and violets. The palate is smooth. The wine is full bodied with elegant tannins giving a strong backbone. The finish is lengthy and rich. Chateau Roulerie Rosé D’Anjou – A semi-dry Rosé wine: Sweet and fruity; 30 percent Gamay, 70 percent Grolleau. A salmon pink hue with a bouquet reminiscent of red berries (raspberries and strawberries). Clear, fresh and tasty finish is balanced by fine acidity. With Memorial Day, and the unofficial start to summer quickly approaching, the beer lover’s palate begins to shift away from porters and stouts (for the most part) and drift to hoppier beers or crisp, clean, almost-summer-sippers. If you’re looking to change up what sits in your fridge or cooler this spring, you’re in luck because Matt Cebula, Craft Brands Manager for Dan Henry Distributing, is here to help. Griffin Claw Norm’s Gateway IPA – A session IPA that is a combination of full hop flavor and lower alcohol content, giving it wonderful drinkability. It’s crisp, clean, fruity and refreshing. Lansing Brewing Co. Amber Cream – This beer has a light bready and caramel malt backbone with just a touch of sweetness to balance. It is the perfect marriage between cream ale and amber ale. North Peak Gale – Double dry hopped, this oat IPA is packed with four to five pounds of hops per barrel of beer and is gusting with aromas of grapefruit and candied pineapple from the addition of Falconer’s Flight and Mosaic hops. Atwater Whango Mango Wheat – It’s tropical paradise in a bottle. Get your mouth ready for the perfect balance of mango sweetness and refreshing wheat flavor. It is brewed to overwhelm but never overpower. Cheboygan Blood Orange Honey – A unique twist on a great American-style wheat beer, with the addition of fresh local wildflower honey mixed with blood orange zest and blood orange puree. The result is a medium bodied beer that is very smooth with a residual sweetness and creaminess from the honey and an exhilarating nose of citrus from the orange. Ellison American Lager – American Lager brewed with barley, corn and rice. Flavorful hops brighten up this beer, which finishes crisp and clean. BATTLE CREEK, Mich. – Atlas Sales Inc., a beer distributor serving Calhoun County, is renewing its commitment to protecting Michigan’s air, land and Great Lakes this Earth Day. In the past, the distributor installed energy efficient lighting and moved to a nearly 100 percent paperless system to reduce its carbon footprint and currently recycles 250 tons of cardboard, cans and glass every year. Along with the near-constant recycling of cardboard, aluminum and glass, Atlas Sales Inc. has also transitioned to energy efficient lighting and operates electric forklifts in its warehouse and works almost exclusively with plastic, reusable pallets, which are better for the environment. Atlas Sales Inc. recycles 224 tons of glass, 30 tons of cardboard and 350,000 pounds of aluminum cans and bottles each year through its in-house recycling facility. Since converting to energy efficient lighting in 2014, the distributor has saved 50,000 kilowatts of power annually. Ann Arbor, Mich. – Rave Associates, Bell’s first beer distributor, has been pulling double-duty this week to deliver cases and kegs to retailers across southeast Michigan in preparation for Oberon Day on Monday, March 26. Oberon, an American Wheat Ale, is one of the most recognizable craft beers in Michigan. It was originally released under the name Solsun, which was eventually changed to Oberon in 1998. Oberon is available in 6-pack and 12-pack bottles, 12-pack cans, 4-pack cans, mini-keg and on draft. A number of bars are tapping Oberon at midnight on March 26. You can find a full list of special events here. Kalamazoo, Mich. – Paw Paw Wine Distributors, the local distributor of Bell’s Brewery products since 1989, has been pulling double-duty this week to deliver close to 10,000 cases and kegs to over 700 participating retailers across the Kalamazoo/Battle Creek area in preparation for Oberon Day on Monday, March 26. Several Kalamazoo area locations will be featuring Oberon release parties, including: Shakespeare’s, Old Burdick’s, The Hopcat, The Union, Taco Bob’s, Harvey’s, The Greentop, The Old Dog, Louis, and a Four Roses Pairing Dinner in Plainwell on Wednesday. Oberon is available in 6-pack and 12-pack bottles, 12-pack cans, 4-pack cans, and of course on draft. Some Bars are tapping Oberon at midnight on March 26 and many others will be featuring it Monday afternoon and throughout this first week of spring. You can find a full list of special events here. 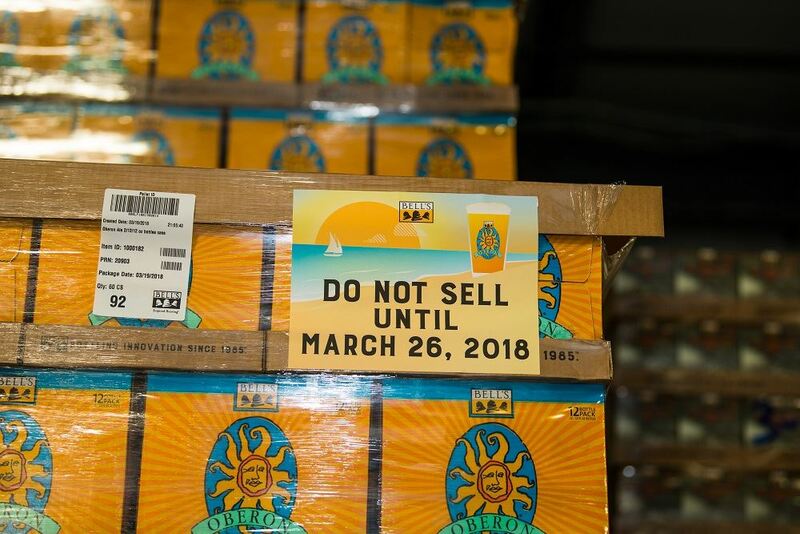 Grand Rapids, Mich. – Alliance Beverage, a Bell’s Brewery distributor since 1990, has been pulling double-duty this week to deliver 35,500 cases and kegs to retailers across West Michigan in preparation for Oberon Day on Monday, March 26. Alliance Beverage distributes Bell’s to the following counties: Western Allegan, Branch, Cass, Clare, Clinton, Eaton, Ingham, Gratiot, Ionia, Isabella, Kent, Lake, Manistee, Mason, Mecosta, Montcalm, Muskegon, Newaygo, Oceana, Osceola, Ottawa, Shiawassee, St. Joseph and southern Van Buren. Michigan — As of March 10, 2018, Imperial Beverage acquired beer distribution rights from Highland Park based Great Lakes Wine & Spirits. The purchase of Bayside Beverage in Marquette, Great Lakes’ Upper Peninsula beer division, includes all beer brands in U.P. counties, which will be added to Imperial’s current portfolio of beer, wine and spirits. In the Upper Peninsula, Great Lakes distributes products in the MillerCoors family of brands, as does Imperial in the Kalamazoo area. “We are excited to be able to represent MillerCoors in the Upper Peninsula, and see it as a great opportunity to expand our partnership with them,” says Larry Cekola, VP of Sales and Marketing at Imperial. Imperial has been working with MillerCoors since 1985, and prior to this addition of the U.P. territory has distributed Coors, Keystone, Blue Moon, Molson and Killians in Kalamazoo, Branch, St. Joseph, and part of Allegan Counties. In addition to the MillerCoors portfolio, Great Lakes serves as a wholesaler for Crown Imports (Corona, Modelo) and Boston Beer (Sam Adams, Angry Orchard) as well as a range of craft beer brands in the Upper Peninsula, including Michigan brands Griffin Claw, Latitude 42 Brewing Co., Cheboygan and Petoskey Brewing Co., as well as national brands like Alaskan Brewing Co. and Uinta. Under the agreement, Imperial has acquired a warehouse facility in Ishpeming and will be expanding their presence with the addition of new brands. Imperial has recently filled 15 new positions to staff the Marquette County facility including sales, warehouse, drivers and management. March 12 marks the first day of operations for Imperial Beverage in their new Ishpeming facility. 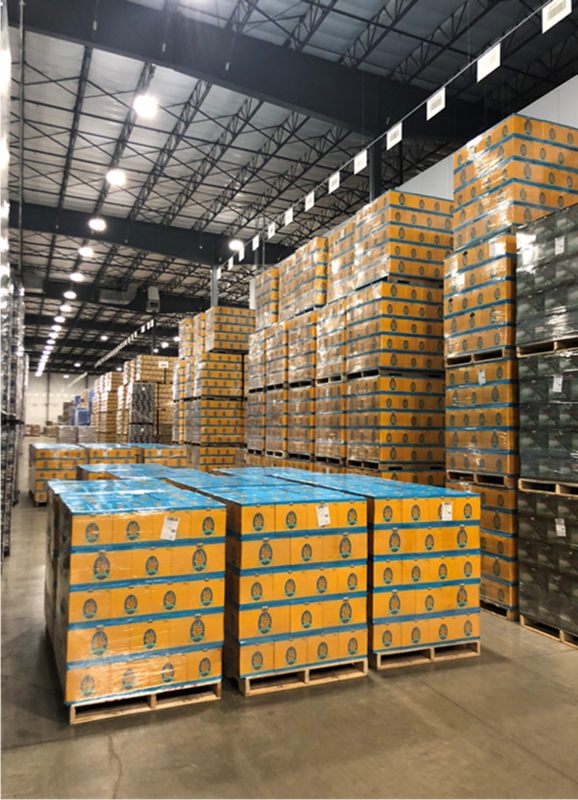 The 18,000-square-foot warehouse will be the fourth base of operations for the Kalamazoo-based Imperial Beverage, whose other facilities include a warehouse in Livonia and cross-docking facility in Traverse City. Imperial Beverage is a long-standing member of the Michigan beverage distribution community. Established in 1933 after the repeal of prohibition and purchased by Kalamazoo’s Cekola family in 1984, Imperial has grown from a one county beer distributor to a top 10 statewide beer, wine & spirits wholesaler. With 330 employees and 3 locations in Kalamazoo, Livonia, and Traverse City, Imperial provides statewide coverage that serves every Michigan County, every week, all year long. Chile’s extreme climate and fertile soil has vaulted the prosperous country to one of the world’s top wine producers. Endless vineyards lie among mountain ranges and sapphire waters, contributing to unique offerings from Chile’s new and established wineries. Lured by the Chilean experience, Scott Thompson, wine sales manager for Traverse City-based H. Cox & Son, spent a week traveling the country and touring countless wineries. He returned, perhaps begrudgingly, with these four suggestions – all of which are available in Michigan. Best known as the grape of Sherry, Pedro Ximenz (PX), when grown in the arid climes of northern Chile, can produce a stylish dry white with appealing floral and fruit aromas, balanced with minerality and crisp acidity. The perfect foil to oysters! With family roots firmly placed in France’s Bordeaux region, dating back to the mid 1800’s, J. Bouchon’s “Canto Sur” is a blend of classic Chilean grapes, featuring Chile’s hallmark grape, Carmenere. Classic red fruit and herbs on the nose lead to great acidity and juiciness on the palate. Felipe Garcia is leading the charge in Chile, inspiring young winemakers to buck convention. This old-vine blend of Syrah, Carignan, Petit Verdot, Mourvedre and Grenache is a great example of the bold, “spice & jam” reds that come from ancient dry-farmed vineyards in Chile’s Itata Valley. Boya Pinot Noir Rose comes from the cool coastal climate of Leyda Valley in Chile’s San Antonia Valley. Proximity to the Pacific Ocean mitigate temperatures, allowing for gradual, controlled ripening. Aromas and flavors lean towards ripe red berry fruit and tangerine, with a crisp, persistent finish.